Although the old adage warns us not to mess with Texas, it doesn’t stop criminals from trying—and when they do, graduates from criminal justice schools in Texas are there to hold them accountable. In fact, the Brennan Center for Justice reports that violent crime in major cities like Austin, Dallas, and Houston has been declining. Many of the dedicated law enforcement and legal professionals in the state began their training in criminal justice degree programs. Continue reading to find out more information about these programs and the career paths commonly taken by graduates. After Criminal Justice School in Texas: What's Next? Although there are many choices for those who want to enroll in criminal justice schools in Texas, it can be overwhelming to know which school or program is best. Using the ranking below can give prospective students confidence that they’re applying to the best schools in the state. We’ve evaluated these colleges based on vital factors such as enrollment rates, tuition cost, and the ratio of instructors to students. 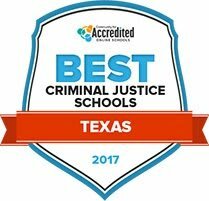 Explore 2017's top criminal justice schools and programs in Texas below. Howard College enrolls about 5,000 students each year. The school's beginnings date back to November 17, 1945. The college mainly serves students living in Big Spring, Texas and its 13 surrounding counties. Howard College is accredited to award criminal justice certificates and associate's degrees. There are four criminal justice technology associate's degrees offered. Degree specializations are chemical dependency counseling, correctional science, criminal justice studies and law enforcement. Credit graduation requirements are generally between 63 and 64. The semester based curriculum includes a blend of core courses, electives and general education classes. Hill College is located in Cleburne, Texas. Foundation of the college's criminal justice degrees is in chemical substance abuse counseling, law enforcement, corrections and evidence technology. Classes that lead to an associate's degree in criminal justice are taught at the Cleburne and Hillsboro campuses. Adults can declare a concentration in criminal justice or law enforcement. Both degrees are worth 60 credit hours each. After completing the courses, students will be able to explain how the criminal justice system works in the United States. They will also understand historical and current developments in law enforcement and be able to apply legal policies and procedures. Grayson College's 60 credit Criminal Justice Associate of Applied Science degree prepares adults for public service careers. The college operates two campuses, one in Van Alstyne, Texas and one in Denison, Texas. Criminal justice majors can also take classes via an online program. Canvas and MyViking are distance education portals that students enrolled in the online program log into to access assignments, videos and reading materials. Adults looking to gain broad hands-on, technical and practical training can receive training at the Texoma Regional Police Academy. Training at the academy leads to a certificate. Galveston College is about 50 miles to the South of Houston, Texas. The college's Criminal Justice Associate of Arts degree curriculum takes place on campus in a classroom setting. Instructors teach students about topics like crime control, criminal law, investigations and criminal law administration. During training, emphasis is placed on local and national criminal law policies and procedures. The college also operates a police academy. The law enforcement portion of the academy training is 643 hours. Graduates can sit for the Texas Peace Officer licensing exam. Academy training is held in the evenings Monday through Friday. McLennan Community College awards three criminal justice associate's degrees and three criminal justice certificates. Degrees are in basic criminal justice, corrections and law enforcement. Certificates are awarded in corrections, law enforcement and forensic science. Full-time students can earn a certificate in one year. It takes two years to earn an associate degree while taking classes full-time. Classes in investigations, physical science, police systems and practices and Texas government prepare students for public safety service at local, state and national levels. McLennan Community College has transfer agreements with Tarleton State University that allow adults to continue their education and earn a bachelor's degree in criminal justice. The College of Criminal Justice within Sam Houston State University offers multiple options for students pursuing bachelor's degrees in the field. Offering bachelor's degrees in criminal justice and victim studies, students can choose the bachelor of science or bachelor of arts route, dependent upon career goals and academic focus. Online degree completion for the criminal justice option, as well as evening class offerings, provide flexibility to suit professionals and busy schedules. Internship opportunities provide a pathway for networking and job placement, while gaining simultaneous hands-on experience and course credit toward degree completion. The bachelor's degree program in criminal justice offered through St. Edward's University is a suitable foundation for careers within the criminal justice field and is often utilized as a foundation for student on a path toward law school. Graduates have pursued roles in probation, corrections, law enforcement, crime analysis, and education, including placements in local state, and federal agencies. The program hinges upon a liberal arts foundation and serves to incorporate many disciplines in offering a diverse core curriculum, with concentrations available in pre-law, law enforcement, or administration of justice. The institution is accredited by the Southern Association of Colleges and Schools Commission on Colleges. With diverse teaching methods and small class sizes at higher levels, the Angelo State University criminal justice program offers degree paths for both undergraduate and graduate students. Accredited by the Commission on Colleges of the Southern Association of Colleges and Schools Commission on Colleges, ASU offers a bachelor's or master's degree in criminal justice, as well as a minor in the field. The master's degree program is solely offered as a fully online program with class duration of 8 or 16 weeks; the program can be completed in as few as 18 months. Undergraduate and graduate options for criminal justice students are offered through the College of Applied Arts at Texas State university. Undergraduate degree concentrations include law enforcement, corrections, and a general degree in criminal justice. The master's degree program is available with or without a thesis option; the doctoral degree can be completed on a part-time or full-time basis and provides the opportunity to complete and publish research and findings. Multiple law enforcement and government agencies are located within close range of the university, providing additional resources for networking, job placement, and research opportunities. The University of Texas Rio Grande Valley provides undergraduate degree options in criminal justice or a combined choice of criminal justice and criminology. The criminal justice and criminology option is offered as a fully online degree completion plan, intended to be completed by students who have previously completed general education requirements. The degree program provides a foundation in research, operations within the criminal justice system, and facilitates career advancement for professionals already working within the field. A master's degree option is also offered and is focused to assist students looking to continue education at the doctoral level. Searching for criminal justice schools can feel like a daunting task—but it doesn’t have to be. By analyzing a variety of data points from schools throughout Texas, we have been able to compile the top schools in terms of overall cost, student success rate, and even class size. Use the tool below to search for schools by degree level, tuition rate, student population, and type of school. There are a number of jobs available to graduates from criminal justice schools in Texas, such as patrol officer, paralegal, police detective, and probation officer positions. The table below highlights some of these jobs and provides information on how many people are employed in specific positions, as well as how much money they make. How Do Texas’s Criminal Justice Careers Compare to the National Average? How do criminal justice salaries in Texas compare to other locations? In some cases, the earnings that professionals make in Texas are close to national averages, or even exceed them. The tables below provide a comparison of state salaries and job growth to national levels to illustrate how Texas stacks up. Not surprisingly, the lion’s share of jobs for those who graduate from criminal justice schools in Texas can be found in large cities like Dallas, Houston, and San Antonio. This section provides data on the number of employees in protective service and legal careers in the largest markets in the state, and the average salaries for these professionals. Dr. del Carmen is currently Professor and Executive Director of the School of Criminology, Criminal Justice and Strategic Studies at Tarleton State University. He also serves as a Federal Monitor for the United States District Court for the Eastern District of Louisiana. In this role, he monitors, on behalf of the U.S. Courts, the New Orleans Police Department. What do criminal justice departments look for when considering students to admit? AThey look for individuals who are motivated and have a core belief and commitment in serving others. What careers are available in Texas to those who complete criminal justice degrees? ACareers vary from police officers to intelligence analysts in the intelligence community. Some of the most frequent careers are police officers, federal agents, correctional officers, judges, lawyers, analysts, lab technicians, statisticians, crime analysts and professors. What makes criminal justice a rewarding career to pursue? AYou will end up serving your country, your state and your fellow community members. In short, you will be committing to an ideal and principle bigger than your own ambitions. What makes the criminal justice profession unique in Texas? AWe are a state that is made up of honest and hardworking people. Texas law enforcement is a national model for others to follow. What makes the criminal justice field unique in your state? AThe criminal justice program at Sam Houston State in Huntsville, in the same town with the headquarters of the Department of Criminal Justice, is a pretty unique fit between academic program and real world application, and there has always been a lot of cross-pollination between the two. The size of the criminal justice population is also significant, though not completely unique, and that inherently makes for more career opportunities. What are the most important qualities that people in the criminal justice field have? There are a lot of different roles in the criminal justice field, but in general there should be some empathy for the less fortunate and a desire to help people. Careers in law enforcement, probation, parole, and corrections, should not be filled by people with a mentality of “teaching criminals a lesson” or other less than empathetic motivations. What criminal justice jobs are most common in your state? ALike every state, law enforcement, supervision, and corrections. What advice would you give to students who are interested in pursuing a career in criminal justice? ABe well-rounded in your education, including and understanding of the research and statistical methods well enough to review treatment literature and the psychology of criminal conduct; core legal concepts in criminal justice, such as due process, separation of powers, and the legal process from beginning to end; and implicit bias, racial disproportionality, and the impact of poverty. AMost criminal justice programs in Texas do not admit students. That is done by the university or college admissions office. Students may choose criminal justice as their major and begin enrolling. Institutions tend to have academic advisors who may be staff or faculty to help students choose a major and to follow degree plans that have been established. AAny career open to any other social science degreed individual is open to a criminal justice graduate. Law enforcement careers exist at the city, county, state and federal level for Texas graduates. Some cities in Texas now require college credits for employment as a police officer including some cities that require the bachelor’s degree. The Texas DPS, Game Wardens, and Park Rangers are state level career opportunities. The federal government has more than 50 agencies that hire criminal investigators or inspectors. Both of these careers require the bachelor’s degree at the federal level. Employment is available from probation, parole, and prison systems in Texas or probation and the prison system at the Federal level. Court systems and prosecutors hire in a variety of roles including bailiff, court administrator, investigator, and trial assistant. Victim assistance programs hire advocates and counselors. This may include organizations that serve only children or only women victims. Substance abuse programs hire counselors and prevention specialists. In Texas, Child and Adult Protective Services hire case workers, independent school districts hire attendance specialists, private retail organizations hire loss prevention specialists, insurance companies hire claims investigators, claims adjustors, and fraud investigators and all of these are careers for Criminal Justice majors in Texas. Private security is a major source of careers for criminal justice majors. Major private security companies employ in Texas. This is not a complete list, but is to demonstrate the wide variety of careers open. Additional careers are open once one finishes a master’s or PhD. Degree. Salaries and Benefits are very good in many careers. Opportunities for advancement exist in many careers. The prevention of crime, protection of people, catching of criminal offenders, serving victims, counseling those in need, providing behavioral correction and other goals are significantly the intangible rewards. Contributing to a just society may be seen as rewarding. AMost criminal justice programs advise their students and graduates to seek careers not just in Texas, but in the nation (any state or federal system). Our graduates are marketable nationwide and students should not limit themselves to only local or Texas job openings. Little is unique in criminal justice professions as similar jobs exist at local, state and national levels and in all states. Includes information on permits, patents, trademarks, and taxes. This page contains information provided by the Texas Economic Development Division. Users can learn about funding a new business, strategies for building a new company, and local and state incentives available to entrepreneurs. Provides comprehensive information that small business owners in Texas need. The Austin Chamber of Commerce provides business growth and development resources to entrepreneurs in the state’s capital. This site is in place to help attract and expand businesses in Texas. This organization provides business resources including financing, certifications and government contracting to small businesses in Texas. This organization creates training programs for corrections professionals and conducts research about the field. The Texas Department of Criminal Justice, or TDCJ, is responsible for managing those who are incarcerated in state-run jails and prisons, as well as private correctional facilities. Anyone interested in starting a career in the corrections industry can find leads from the Texas Department of Criminal Justice on this page. The TJJD provides information about the juvenile justice system in Texas. It contains resources for the public about programs, facilities, probation, community services and more. The Parole Division promotes public safety through supervision, programs and services for offenders. Provides seminars, education, conventions, and certifications for court reporters around the state. This website has information about the different courts in Texas and what jurisdictions they handle. Also, users can find training materials, information on court rules, and forms that are used in court cases. The Texas Municipal Courts Association, or TXMCA, offers training and support to those who work for municipal courts around the state. The TCJC seeks to improve the criminal justice system in Texas for adults and youths by providing policy research and advocacy. The Texas chapter of the national organization for Court Appointed Special Advocates provides resources and advocacy for children who have been abused and neglected. A membership-based organization, the TJCJ provides education and resources for judges in Texas. The State Bar of Texas supports the legal profession and fosters high standards for attorneys. Provides career support, including education, certification programs, and networking events. This site allows users to search for specific parts of the Texas Constitution, as well as statutes, administrative rules, and Attorney General Opinions. There is also information on building codes, municipal laws, and federal statutes. Since 1949, TTLA has provided trial attorneys with professional development support, such as continuing legal education courses, conferences, and networking opportunities. This webpage provides membership-based resources for paralegals in the state of Texas. The Texas Attorney General is responsible for providing legal counsel and representation to state entities and employees as well as consumer protection to Texas residents. This page has information from the Texas Municipal Courts Education Center on the training programs it provides for warrant officers and bailiffs. Job listings from the Texas Juvenile Justice Department. Agency responsible for licensing private investigators in Texas. This organization provides education and advocacy services to those in the animal control profession. Organization that provides education and resources to private investigators. This association serves a relatively small group of Texas officers who are in charge of investigating gangs and organized crime. A membership-based group, the association provides information about training and connects members. Job leads from the Texas Parks & Wildlife Department are available on this page. TPWD is responsible for managing and conserving the state’s natural resources. This group works to protect wildlife in Texas. This page provides information about wildfire investigators in Texas. Texas game wardens provide law enforcement, water safety and search and rescue. Their mission is to serve the citizens of Texas and protect the state’s natural resources. State park police provide safety services in Texas state parks to protect visitors and the park’s resources. This page provides career information about working conditions and recruiting.